This is Ellen's kitchen where everything happens in the eating world of our home. This old house does not have a separate dining room so we cook and eat and live with all the dirty dishes right here. We have a gas stove top with four burners and a separate double electric oven. The double oven comes in handy, especially for our holiday or large family meals. The counter spaces are more then adequate for our mixing and baking needs. We use the island top for buffet service for our larger family meals besides mixing and assembling. Our kitchen/eating area is also connected to our family room. This space has been worked in for very simple meals and very fancy meals. Even though I enjoy creating gourmet meals, for the most part I'm a fan of coming up with simple ideas for meals and appetizers, too. These mini frozen puff pastry cups come in handy for a quick appetizer that are savory or a one bite dessert. Keep them in your freezer for those last minute inspirations. These are filled with chopped Pancetta (Italian bacon) and basil. I sauteed the pancetta with a little chopped onion and added in chopped basil then filled the already baked cups. Here is an easy tip for a comfort family meal of chicken pot pie that I learned after an epic fail. The photo above shows what the casserole looked like when I first took it out of the oven. The problem was the biscuits were doughy on the bottom. So I took them all off and put them back in the oven to bake properly, then added them back on top. In the future I will bake the biscuits separately and just add them to the top of the cooked filling. Mix up your chopped onion, and cubed potatoes and saute them in butter and oil together on the stove top until the onion is translucent, sprinkle this mixture with 2-3 tablespoons of flour and cook for at least 2 minutes. Add 2-3 cups milk and cook till the mixture thickens. Add your chopped carrots, peas, and cooked chicken and mix together well. Transfer this mixture to a large casserole pan and bake in the oven till the potatoes are soft. If you have two ovens bake two cans (16 biscuits) of buttermilk biscuits according to can instructions at the same time the casserole is in the oven. If you only have one oven you could put the casserole and the biscuits in the oven at the same time. Add the already baked biscuits to the top of the chicken pie mixture. This method gives you a nice pot pie without soggy biscuits. Of course you can make your own biscuits from scratch and bake them separately, too. I hope you enjoyed Saturday in my kitchen. Do you have quick go to ideas from your kitchen? Sherrill, I started them on top of the casserole then took them off when the bottoms did not bake well. After I took them off I put them all together in the oven to bake them properly and then put them on top again. That's how this idea came to be, from an epic fail. I'll always bake them separately in the future. OK thanks. Seems to me to keep them the shape of the pan, they'd have to be started on top but not sure. Appreciate it! Great idea on the biscuit/chicken pot pie. Will do that next time! My tip:I cook quesadilla directly on my glass cook top burner. Whole wheat tortilla and goat cheese melted perfectly for cutting in wedges to go with tomato soup. No pan/grill to clean up! Seriously? I must try that! Thanks for the great tip, J! Fun post Ellen. I love a kitchen tour any day of the week. Loved seeing your kitchen and how everything works there. 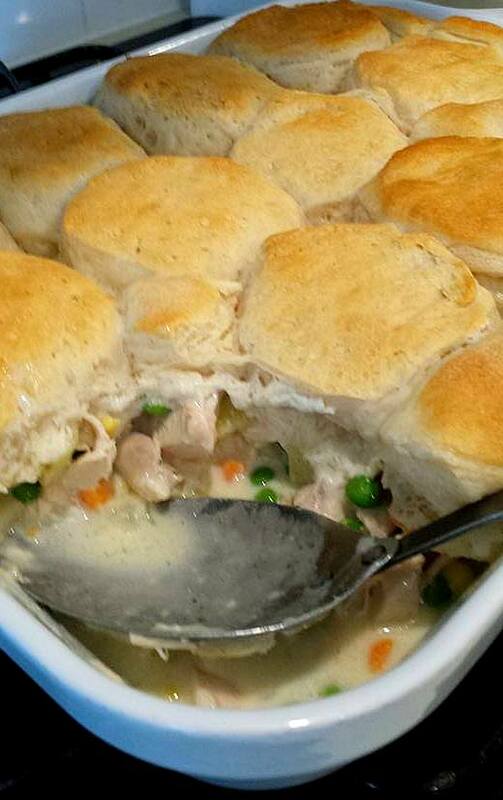 The chicken pot pie/biscuit bake looks so good! Great tip for making the biscuits ahead first. Quick tip: I like meatloaf, but I don't like how long it takes, so I make individual sized meatloaves and bake them on a cookie sheet. They cook faster and it's fun to have your very own meatloaf to eat! Those individual meatloaves sound great, Gumbo Lily! I love your kitchen Ellen!!!! That pot pie and appetizers look so delicious.